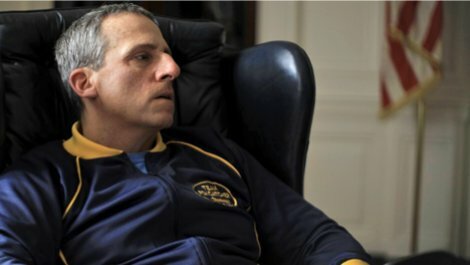 Steve Carell and comedy go hand-in-hand. However, this coming Oscar season, Carell tries on a new role as a stern and sullen wrestling coach in his new movie, Foxcatcher. Steve Carrell is usually known as the funny man. His filmography contains several comedic roles including The 40-Year-Old Virgin, Anchorman, and Little Miss Sunshine. He has occurred several times on Saturday Night Live showing his true colors with sketch comedy and flat-out funny improv. However, it was a his role as playing Michael Scott on The Office, a mockumentary style sitcom, that earned him a Golden Globe along with five nominations throughout the shows run. It seemed at the time that comedy was the only genre Carell will ever do. Carell is known to play around with more dramatic roles in smaller films, yet he still manages a smile here and there. He played a struggling dad in Dan in Real Life and a harsh stepfather in the indie film, The Way Way Back. (A GREAT off the beaten path typical indie film I would highly recommend.) Anyway, in the first fifteen seconds of the preview for his new film, Carell embodies a character like never before. He has a serious and intense attitude and it is a complete 180 from Michael Scott. Carell plays John du Pont, an aspiring Olympic wresting coach to the Schultz brothers. The film focuses around the coach/athlete relationship that ends up going a little to far. Not only does Carell act and sound more mellow, he also took it upon himself to change his look for the part by adding on a prosthetic nose. Carell is joined by a great ensemble cast including Channing Tatum and Mark Ruffalo. I am excited to see this side of Carell. It is unlike any other role we have seen him in before and it does not look like he will disappoint. Foxcatcher has already had a ton of buzz since the first trailer was released. It won for best director at the Cannes Film Festival and probably will continue to win many awards this season. Carell will certainly turn a few heads with this transforming role showing that he is more capable than just being the funny guy. Foxcatcher is based on a true story and is in theaters November 14th.